In this step-by-step WordPress tutorial, we show you how to use Elementor to create a beautiful 5 page website. Want to learn how to use Elementor? There have been many times in which I have gotten disappointed with promising premium themes that proved to be incredibly slow. This was money that had been wasted, because there was no chance I would stay with any multipurpose theme, that promised the world, but ended up with pages that took 4-5 seconds to load. A disaster in terms of SEO. 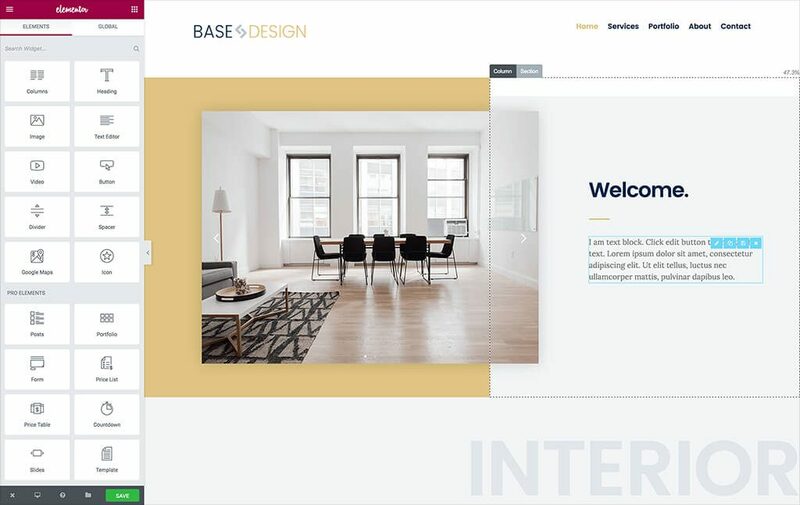 This is why I was so excited with the release of the recent starter theme called ‘Base Theme’, created by the professional Sitepoint team with speed and minimalism in mind. Base Theme also included full compatibility with page builders, making it the perfect candidate to test with Elementor. Make sure you have your WordPress installation ready, along with Elementor page builder installed. 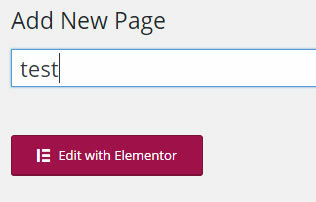 In the WordPress dashboard, go to ‘Plugins’ > ‘Add new’, and enter ‘Elementor’ in the search bar. Then click the ‘Install’ button, and then the ‘activate’ button. Go to ‘Pages’ > ‘Add new’. Then, click the ‘Edit with Elementor’ button. You should now be inside the Elementor editor. Click ‘Add template’ and choose from the wide array of free and paid templates. It is advised to start with a template to get to know how the different elements of the page are built. I would also recommend watching this short video about the Elementor structure. Each Elementor page is made up of sections, columns and widgets. Sections divide the page into horizontal rows. Columns divide each section into vertical columns, and widgets are dragged and dropped inside the column. Let’s try adding a new widget into a page. Delete one of the widgets in the template you’ve inserted by clicking on widget and then clicking on the X icon. Then, in the left panel, search for the button widget and drag it into the empty area where you’ve just deleted the widget. Go to a heading widget on the page and click on it. It will open the heading settings on the left panel. Go to the middle ‘Style’ tab, and switch on ‘Typography’. Now, under ‘Family’, you can browse through the various fonts and choose a different font family. For a more detailed 30 minute video , see this Elementor + WordPress tutorial we’ve made not long ago. Base Theme is completely mobile responsive, and has a perfect mobile score on Google’s Mobile Testing tool. Base Theme is completely open source and free, and seem to be built with the developer in mind. The theme is compatible with WPML, which is a must nowadays, unless you are willing to let go of over 48% of all websites. SBT makes it easy to add WooCommerce. With Elementor Pro's extended WC widgets, this makes it the perfect candidate for online shops as well. As you can see in the 45 minute video tutorial, pairing up Base Theme and Elementor lets you create super-fast WordPress websites, in a lot less time than before. Base Theme is perfect for small business sites with 5-10 pages, for creating super fast landing pages and for building child themes on. Developers can use it to create complex websites, by customizing the structure of every page. Base Theme is less fitting for a newbie WordPress user who still wants to create a content rich website. This is because it is still a starter theme, and doesn’t allow for a flexible and easy way to change the structure of website sections like the blog area. To customize these areas with Base Theme you would need to use code. Still, for most websites using Base Theme and Elementor is quite sufficient. This is just the tip of the iceberg, and you can learn more about Elementors’ widgets, features and capabilities in over 50 videos we previously published in our YouTube channel. 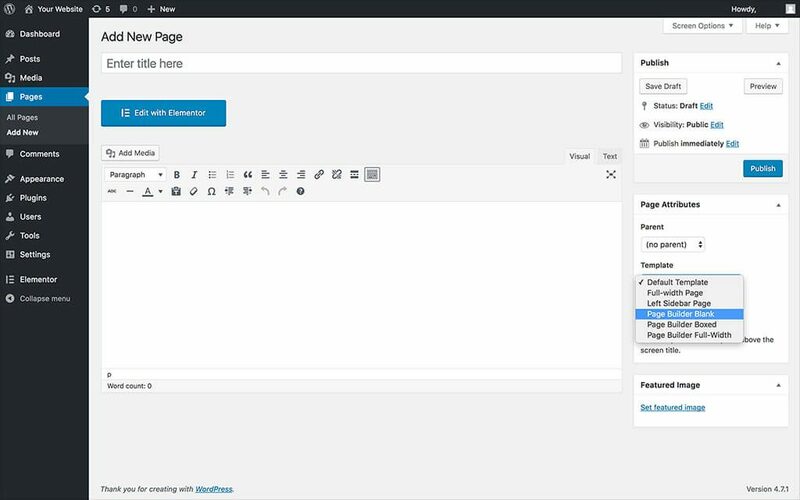 WordPress users are starting to realize that there is great potential in using a free starter theme like Base Theme and a free page builder like Elementor. You can design a website easily and quickly, without having to spend too much time coding. Using this theme & plugin combo is in the spirit of Open Source that managed to make WordPress the number 1 CMS in the world. I hope you too will find this combination useful when creating your own site. I invite you to Download Elementor and Base Theme for free and start experimenting with creating your own beautiful website. I was trying to use elementor for my project earlier I am using cornerstone but I am facing few problems if you have any solution for them. #1 whenever i try to use your prebuilt templates , like Product-App and Home-page-app, I tired with these 2 templates for now, but whenever i try to make modifications there come errors and elementor stops responding http://take.ms/622Zt this is screenshot which may help you at some extant. #2 i didn’t find custom js section, is it available in pro, like custom css or you don’t have custom js or jquery support? Can you guys make a tutorial on how to design a complete WordPress Website/Blog like this elementor blog ( https://elementor.com/blog/blog/ ). Is it using aleph theme from pojo.me and generate press ? We might publish this in the future. In the meantime, you can watch the video we’ve made on the posts widget. i ve watched the vid ben,but i stii can t figure it out how to use the posts widget….does not showing nothing when i draw it….can u point me in the right direction ? Are you still recommending using the GeneratePress theme? Is GP just as fast as Base? In your professional opinion, what is the difference between the two? Both themes are fast, GP is more than a starter theme, and is more flexible and also is the better match for people unfamiliar with coding. I bought the Pro version of GP several months ago and I like it. But, when I read that Base is super faster, I want that extra speed. So, Ben, have you tested it? Is Base faster and cleaner that GP? It’s better to know than not to know, right? Loved the tutorial, and with a few minor tweaks, Base is a great theme. One thing: this site is not very responsive. Will you be doing a tutorial on that as well? Because I think it is more important to have great mobile presence than a desktop. Why do page builder plug-ins obsess with NEW websites? How come there is so little information or support for using Elementor with EXISTING sites? Elementor should devote an entire section of its support to using Elementor and Elementor Templates with existing sites. 1. People tend to get attached to their site. If they want to change it, they change all of it, and a lot of the times this means designing everything from scratch. 2. Not all page builders or themes are as flexible as Elementor. When you switch off Elementor, all your HTML content stays in tact. You are also not confined to a single theme. Other themes and page builders lock you in, so basically to get off them, you need to build everything from scratch. UnderStrap Bootstrap Starter Theme is also good. 1. how can i control the menu location an appearance? you did not address it at all. can i have 2 menus? one above and one below the header? 2. you mentioned that every change we make in the margin we need to change in the mobile properties too. is this guidance exist in the link you metioned above? 1. Menu design is still not available in Elementor. It is currently controlled by the theme. 2. You don’t have to set a different margin for every mobile property. The right methodology is, once you finished designing the page, go to mobile view, and fix the margin where needed. Check out the previous videos we made on this subject on our YouTube channel. thank you for your prompt reply. are u planning to control the menu appearancd with elementor in the future? by the way, who designed the theme which you have reconstructed? It looks a great tool and very easy to use. Anyway how you can replicate the part where the menu and logo appear in this website http://cleanco2-demo.detheme.com/cleanco-blue/ and where the slider section is under. Following the demo using the same Base Theme, Do we need to use a code in order to get the same design? Thanks in advance for any suggestion or ideas. We still don’t have a menu widget in Elementor, and our slider is simpler than the one used on that page, but you could use third party plugins to recreate a similar page in Elementor, sure. Fair enough… I will find out which plugin could help me to get the same result. Thanks..
What’s your opinion about Elementor with Genesis themes in terms of speed and usability especially compared to GP? Trying to make a choice. Both are great choices and work amazingly well with Elementor. Sorry to ask you this here, but I see no contact page on the Elementor website. I fell a bit confused with the choice of a theme. GP looks great, but if I go Pro with them, do I still need to use Elementor? After all they make sections and page headers… But, there are no coumns, right, and no slider…. So, if I go Pro with Elementor as well as with GP, won’t it be to much, or complicated or heavy ? Will you create a member/team element? Yes this will be added in the future. In the meantime you can use the testimonial widget for the same purpose. Thanks, looking forward to update. Good afternoon friends. First of all, I want to thank you for such a wonderful product like Fakir. I would like that you know that they are in Ukraine and countries in Armenia. Thank you for the hard work you put into this work. In fact, my question is, I hope you can help me. I am an internet marketer, but my hobby design. Your plugin allows you to display all the colors of the soul and imagination on the project site. It’s just great! Recently, my friend saw that I was doing a website and wants to be for its resorts, which I made a site. I agreed and began to read in detail how to make a website. I came across many forums, blogs, where people say that the websites developed by designers WP is very slow, and often corrupt, and off by themselves. You, as a developer, please notify us that there is a risk that the site will no longer work independently, after the upgrade, or perhaps your WP plugin? And the download speed is really so slow? I would like to assure you there is no risk that your site will no longer work. Thanks a lot, so when I make my first website on your designer, I’ll show you. Thanks again for your help and the wonderful plugin. Спасибо большое, значит когда я сделать свой первый сайт на вашем конструктор, я буду вам показывать. Еще раз спасибо вам за помощь и чудесный плагин. Thanks. GeneratePress is too limited for its free version. That’s why I don’t like it. And I hope you stop recommending it with Elementor. What is the code based on? Is it by chance BootStrap or even lovely Foundation? It’s our own code. No Bootstrap. When I create the page in the first step it takes me into a page that looks nothing like this. Id doesn’t have the gray background, the orangish color background, none of the elements, etc… What am I missing? Hi Wade, sorry for the misunderstanding. Let’s start with the basics. You need to go to Base Theme’s Customizer and customize the logo and menu. Once you have the menu and logo like you want, you can go on to the rest of page. Hi Ben, can i find this website that you built in the internet? so i can get better understanding of how it looks like? To the “Base” template has the option to be right to left? I’m not sure. Try it. Using menu anchors for easy page navigation is great. Just one quirk. It will scroll long if using a fixed menu. How can we add an offset css class to adjust the padding for the anchor? Menu Anchor > Advanced includes the ability to add a CSS class. thank you, but i don’t understand how to install it (i click on it and the web page open, but i don’t understand what i am supposed to do with it). Quick piece of css code to insert for a 85px offset? That’s the height of my fixed top menu. I was searching “how to make a website on wordpress for free?” I saw many suggestions to make a website on wordpress. Recently, I’ve seen your article and read it carefully. You’ve explained very good. I really liked it. So, keep up the good work. I have designed a template by using elemector. I’d like to export that new website as a wp template. Is that possible? really explained well, but i wanna know that, a website or blog can be create by free version of elementor or i have to go for pro version and can you tell me how to create a blog by elementor. The website I created with Elementor doesn’t show on the internet. What can I do to fix this? There is no conflict with an other page builder. Is there any tutorial how to use elementor in custom theme development? It it will really helpful for me. We have premium support in our Pro plugin. We can take your login, look into the site and see what’s wrong. where can I find ‘base theme’, it is not in wordpress theme search. Hi, I am using Ocean WP theme and Elementor (free) for designing my site. Under portfolio page, there are five pages which are not showing on the portfolio page. What to do for showing it on the page. If you can help me,it will be great. I am not a web designer or any other technical knowledge regarding this. What i did is by trial and error. Thanks in advance. Hi Ben for the slider do I need to purchase elementor pro? Is there other things in this tutorial that need the pro version? Hi, Whenever I am trying to create a new page using Elementor, it is saying preview not loaded. It is most likely a theme or plugin conflict. Its not available any more Ben!!! Please check. When I get to the “click add template” there is no such button. did they change the interface? Can i rename Sitepoint Base theme name to another name. There is no built-in function to do this. However, you can use this link to rename the theme. Just a quick question. I saw you use in the tutorial an ‘Icon Box’ for each ‘Service’. Could you please clarify whether the Icon Box or Headers and Text Boxes should be used to setup each service. How to Integrate Elementor Page Builder in custom theme ? Hi, i like Elementor, becaus it has a clear concept. But its hard to get started. so how to get to the starting point of this video? searching base theme brings to much entries in wp, searching sitepoint base get three themes one is “sitepoint base”. Using this, so the page is not looking like at the beginning to the video. so can you give an step by step intro to this video, may it helps poeple to get started with elementor. I agree. This is my second time using Elementor and it is not as ” easy” as the company advertises. There is nothing that I have found that is really aimed at newbies. Its like a tech person created what would be ” easy for them ” rather than looking at the basic features someone would need to get started. I am still stuck on a damn header image. And the Phlox Theme as alot of bugs on the free version. Why spend money on that and Elementor ? If I do one, there is no reason for the other. SMH.. What is easy to the company obviously wasn’t easy for the rest of us. Every professional tool has a learning curve. Designers and marketers alike use Elementor to build amazing websites. I invite you to follow our tutorials and gradually improve your Elementor skills.